The remarkable cricket career of Queensbury CC’s Kirstin Smith took a further leap forward last Saturday when she became the first woman to take eight wickets against the men in a Spenser Wilson Halifax League fixture. She recorded figures of 16.1-4-56-8 in the Division One second XI fixture at home to Stones CC. 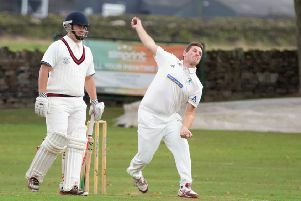 The Ripponden side were dismissed for 119 and Queensbury won by nine wickets. Kirstin has played cricket since she was eight years old, first at Illingworth St Mary’s CC and then at Queensbury from the age of 15. She has represented Yorkshire at various age groups, including the LV Under-17 County Championship team of 2009. The 25 year-old had four years out of the game due to a knee injury and then heart surgery, having been born with an extra pathway in her heart which led to it beating up to 230 times a minute. The corrective surgery went well and Kirstin was able to keep going for more than 16 overs in Saturday’s warm weather but admitted to still aching two days later. Kirstin is a qualified Level 2 coach and head women’s coach at The Cricket Asylum, Sowerby Bridge. She returned to playing regularly this season and is an ever-present for Queensbury seconds, also finding time to be the secretary of the Halifax Junior Cricket League and the league’s under-13s coach. Her bowling performance last Saturday was also the second-best for any player in the annals of Queensbury CC, formed in 2000 by the merger of Union Croft and Yews Green cricket clubs. Halifax League press officer Paul Whiteley also reckons Saturday’s performance must stand as the best bowling performance ever in the UK by a woman at altitude.